Twelve Atlantic Station is an impressive building in a premiere Atlanta location. Amenities include a fitness center, pool and 24 hour concierge. 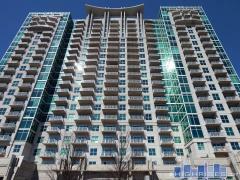 Twelve Atlantic Station condos feature granite/stainless kitchens, hardwood floors and other upgrades. This condo tower is a member of the Twelve hotel chain, with a sister property downtown called Twelve Centennial. This particular Twelve building shares space with the hotel and is adjacent to the Atlantic Station district. Have any comments or questions about Twelve Atlantic Station? Ask your question and/or share your thoughts about this Building. I'm working on a film project, and we are looking to house our Asst. Director in the area from this Sunday, July 23, to December 14th. We would like something furnished. Is this something you provide, and if so, how much would the monthly fee be for a 1 bd 1 ba unit be? She will need a kitchen as well.